Neodymium Self-Adhesive Magnets are now available online and is a new range offered by HANGSENG Magnetics. Neodymium magnets with adhesive are powerful, compact magnetic discs with an easy pull-tab adhesive liner. Designed to save time and effort, this is definitely a less labor-intensive option and a benefit for those with poor dexterity. Our Self-Adhesive Magnets provide great magnetic strength combined with an easy to use 3M adhesive strip on the back to fix the magnet to a variety of compatible surfaces, such as wood, gyprock, aluminium, steel or plastic. These neodymium self-adhesive magnets come in different sizes and dimensions and are ideal for securing and displaying items, banners, signage, and sticking on any surface at your warehouse, office or home. Package closure magnets are magnetized conventionally through the thickness. In order to achieve perfect alignment with magnet-to-magnet applications, you will need to match magnets with adhesive on the north side of the magnet to magnets with adhesive on the south side of the magnet. • South pole magnets are marked with a red dot on the north face for easy identification and matching during production in conjunction with the unmarked counterparts. • Convenient plastic spacers for easy handing Specifications. • The liner which covers the adhesive has a die-cut tab for easy removal, saving time and effort. Alternatives to these adhesive magnets are our very thin magnetic squares and circles. They are made of ferrite and can be glued on but have a significantly lower adhesive force than neodymium magnets. Therefore, they are not suitable for closures but they can hold up cards, photos, etc. on the fridge or whiteboard. 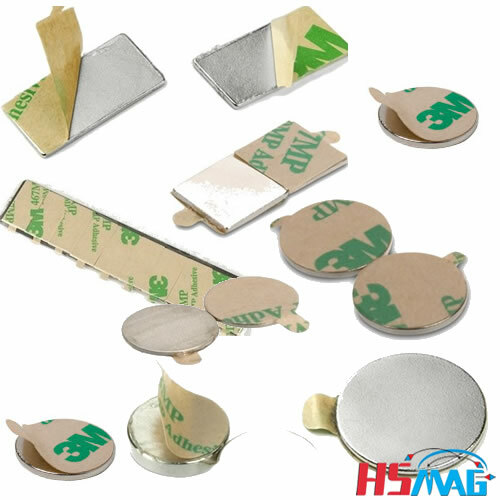 HSMAG offers Neodymium discs and rectangles with adhesive on one side. They are commonly used in packaging, box closure, display and door latch applications. Dimensions are listed in inches. Additional sizes, plating options and grade choices are also available upon request and may be on hand from stock. Contact us at EMAIL or TEL.